It was my long time desire to make kutti button thattai for my Kutti Krishna. As it is small in size, I named it button thattai. This crispy, peppery thattai is slightly different from regular thattai. As Krishna Jayanthi is fast approaching, I thought of posting this now. This is an easy to make, perfect tea-time snack too. You can also make regular-sized thattais using this recipe. Pepper powder - 3/4 tsp. Prepare rice flour and urad dhal powder as mentioned in this link. Dry roast pepper and powder it coarsely. 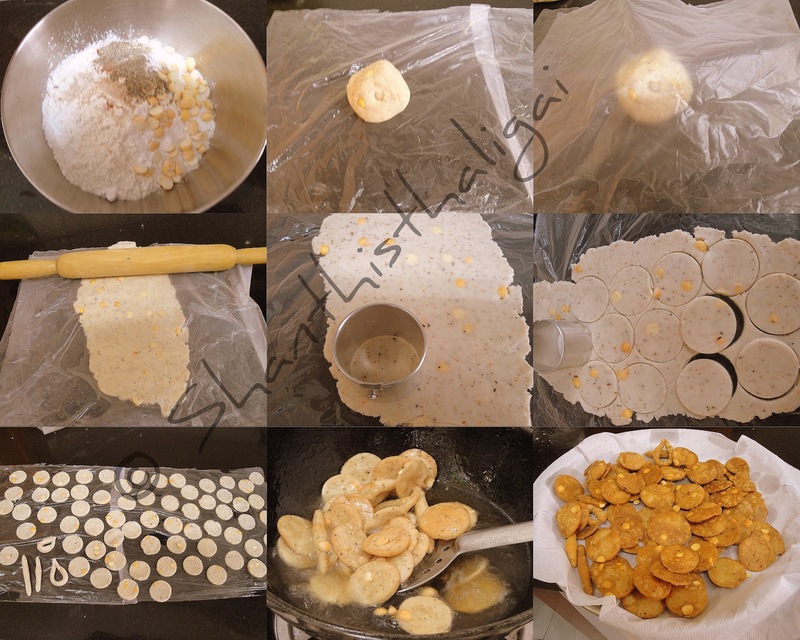 Dry roast rice flour and urad dhal flour separately until hot. When slightly cool, combine all the ingredients (except oil), mix well and make a stiff dough using water. Make even sized balls from the dough. Grease a plastic sheet with oil, place a ball in it, cover with another greased plastic sheet and flatten the ball evenly with a rolling pin. Cut out discs with a round shaped small cookie cutter. Prick the thattais with a fork. Doing like this avoids puffing of thattais. Heat oil, and slide the thattais gently in oil. Deep fry on both sides until golden brown. Drain on a kitchen tissue. Sri Krishna Jayanthi offering, button pepper thattai is ready. When cool, store in an air-tight container. wow sooper mouth watering i will try.